Low-linting for cleaning and drying windows, soft enough for polishing, yet strong and durable for finishing metals. 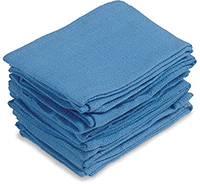 Large sized (16" x 24") new, hemmed towels packaged in boxes of 100. Check out our other towels!